To discover something of what Christmas means in Malta, rent a self catering apartments or villas for the Christmas period and watch the Maltese at work and play. Because Malta is generally regarded as a Catholic country, people celebrate Christmas in a big way. The festivities tend to concentrate around church and family although there are certain events that would appeal to foreign tourists. The Valleta Christmas train offers a sughtseeing tour of the capital on Christmas Day and New Year's Day. It leaves from outside St. John's Church on the hour from ten in the morning until 9 pm at night. It is festively decorated with Christmas decorations and garlands. Carols by candlelight are sung at St. John's Church - something traditionally atmospheric for this time of year. There are nativity cribs all around Malta and Gozo, each vying with others to be the most impressive. Some have clockwork mechanisms to create an moving display. Christmas Day is a public holiday, shops and restaurants will be closed. The best entertainment is to walk around near your accommodation and admire Christmas decorations Maltese style. The Maltese are very British in their outlook and even have a similar Christmas lunch of roast turkey with all the trimmings. Town centres and beaches will be practically deserted whilst families spend Christmas together. It could be a very lonely time unless you're holidaying with a family of your own. 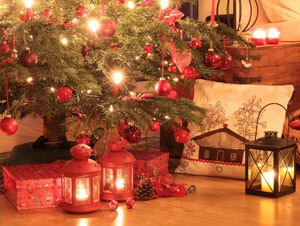 If you decide to spend Christmas in England instead, take a look at Christmas cottages to rent in England. The weather is colder and the traditions a little more varied. For a musical evening, the Malta Philharmonic Orchestra presents classic Christmas Concerts at the end of December, just prior to Christmas. Look out for dates in December. ©www.selfcateringholidaysmalta.eu 2019 - All rights reserved. www.selfcateringholidaysmalta.eu is trading names of XE Website Solutions Ltd.